As we get older, we all begin to see signs of aging on our faces. Wrinkles and crow’s feet form around the eyes while creases and fine lines settle into the forehead, cheeks and mouth. These pesky lines and wrinkles may be common, but they also create an older-looking, tired look. At Mack Eye Center, we offer a non-invasive solution for patients who seek facial rejuvenation but are not ready to undergo surgical treatment. If this sounds like you, consider Botox in Hoffman Estates. Botox is a quick and effective procedure that helps restore a younger-looking face. Read on to learn more about how Botox can rejuvenate your appearance. Botox is an FDA-approved neurotoxin injectable used to treat dynamic wrinkles (wrinkles that appear when smiling, frowning or making other facial expressions). The treatment works by temporarily relaxing the facial muscles and preventing them from contracting. As a result, the wrinkles on the overlying skin are smoothed out, creating a younger-looking facial appearance. Treatment with Botox can be performed in just one convenient visit to our office near Hoffman Estates and in as little as 30 minutes. Botox injections are painless; however, a numbing cream may be applied on the treatment area to minimize discomfort. During the procedure, your doctor will use a fine needle to inject Botox into the facial muscles being treated. The targeted muscles stop contracting, and the overlying skin becomes smoother. This effect is gradual, and typically occurs in as little as three to five days after treatment. What’s The Recovery Time for Botox? Immediately after your procedure, you may experience some slight redness and swelling in the treatment area. These side effects are temporary and should dissipate a day or two after treatment. There is no downtime required with Botox; you are free to return to your normal routine immediately and enjoy your rejuvenated appearance. The cost of Botox will depend on both the treatment area and how much Botox will be required to achieve the desired results. For example, Botox for your forehead will require more injection than Botox for crow’s feet, so it will be more costly. Hoffman Estates, Schaumburg, & Palatine patients can learn the exact cost of their Botox treatment during a consultation. When administered by an experienced physician, Botox is safe. Be sure to do your research before selecting someone to give you Botox. Any pain felt while receiving Botox is the result of an inexperienced physician. Botox itself is not painful. However, getting any kind of injection from an inexperienced person can result in some discomfort. To avoid this, be sure to find a credible and practiced Botox provider. The best way to prepare for Botox is to have a comprehensive discussion with your Botox provider about what to expect. Your doctor will evaluate whether you are a good candidate for Botox, and will let you know what medications or behaviors to avoid beforehand. The effects of Botox are temporary and typically last three to four months, depending on the amount of Botox used and the extent of your wrinkles. To maintain your rejuvenated appearance, our doctors recommend you schedule repeat treatments. After a couple of years of repeat injections, it is not unusual for people to go six to 12 months between treatments. 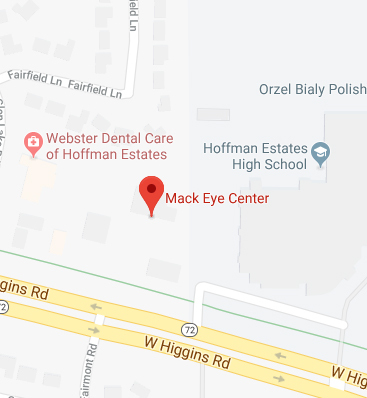 Hoffman Estates patients can schedule a consultation to learn more about Botox and how it can help you regain a softer, youthful appearance, contact Mack Eye Center. Schedule your one-on-one consultation today by calling (847) 755-9393.